Help the pirates sail the high seas to discover their long lost treasure and you might just find yourself taking home a share of the buried treasure. The captain of the ship is the leader of this treasure expedition, so stick close to this eye-patch wearing leader. 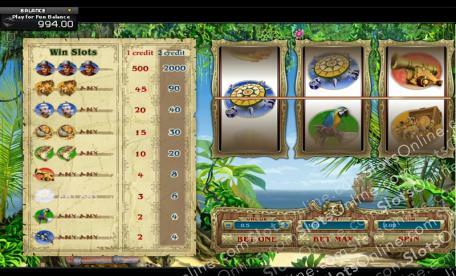 This ruthless captain holds the top payout in this single payline, 3 reel traditional game. Spin three of them across the line and you’ll pick up 2,000 coins. Of course, you’re in search of buried treasure, so be sure to spin in as many chests as possible. Two of these symbols on the line will bring in up to 90 coins. The ship is another valuable symbol. Two or more will get you up to 40 coins. There are plenty of other symbols to help you in your pirate’s quest. These include bags of gold, treasure maps, cannons, flags, parrots, and compasses. As this is a traditional 3 reel game, it uses a coin betting system. You can select the value of your coins and then decide how many you want to wager. Be sure to bet the max of two coins if you want to activate the highest paying pay table. There is certainly plenty of treasure to be won on this pirate adventure!